I’m always on the look out for quick and easy dinner recipes which utilise some of the contents of my store cupboard. This recipe, created when I had some left over pork steaks, is exactly that. Most things in it I usually have in. Popping the ingredients together like this though really gave the pork a whole new lease of life. My OH was worried that it wouldn’t be filling enough given the spiralized veg noodles however I can confirm it really was! If you want to beef it up a bit more, you could also add some spiralized courgette. The flavours are lovely and best of all, the whole thing is ready in less than 15 minutes. In a bowl mix together the honey, harissa and lemon juice. Take the pork and pop each piece inside some baking paper. Beat with a meat mallet or rolling pin until the pork is around ½ cm thick. Pop the pork in the bowl with the marinade and pop in the fridge until you need it. Spray a large frying pan with low calorie spray (I used the coconut one and it was lovely). Heat and then add the carrot, sweet potato, red onion, garlic and cumin seeds, season and stir fry until the sweet potato becomes tender but still retains a bite (around 5-6 minutes). Add a few drops of water as you are frying to keep the pan lubricated and the noodles cooking. Add the fresh coriander, toss through and cook for another minute. While the noodles are cooking, spray a griddle pan with low cal spray and heat up. Season the pork on one side and then add to the frying pan, cooking on one side for 3-4 minutes. Season the other side while one side is cooking and then flip, cooking for 3-4 minutes on the other side (or until cooked through). The pork shouldn’t take too long to cook as you have made it nice and thin. Add the rocket to the noodle pan and toss through so it wilts a little. Then split the noodles between two bowls. 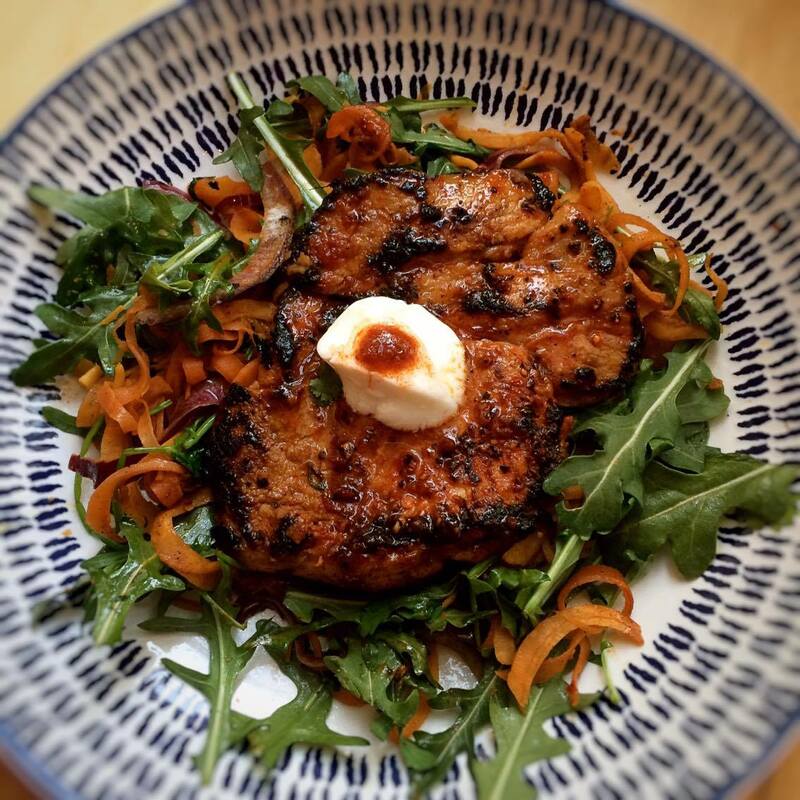 Top with the pork steak and garnish with a teaspoon of yoghurt and dash of harissa pasta. Serve with an extra quarter of lemon. Delicious meal. I substituted the sweet potato for courgette as I try to limit my carbs in the evening. So pleased you enjoyed it Marilyn and great idea to make the substitute! I tried this recipe tonight using turkey breast steaks instead of pork. It was equally delicious. I also spiralised celeriac as an experiment with spiralised carrot, spring onions sliced lengthwise and home grown kale. Not bad at all, and the celeriac complemented the cumin perfectly. Just made this and omg – absolutely delicious! Loved every mouthful, as did my husband. I’ve yet to find a recipe of yours that isn’t divine! Keep them coming!